I tried out my first non-saucy crock pot meal and I'm happy to say that it turned out pretty darn well. I used to be under the impression that cooking in the crock pot meant you had to smother the meat you were cooking in order for it to cook properly, but let me tell you - that is not the case. I have discovered, however, that you do need to have a little bit of moisture in there if you don't want dried out food. But you only need a tiny bit in order to have yummy meat that doesn't taste like you're eating cardboard. For this chicken in particular, I used just a little bit of chicken broth for the liquid. It added a nice additional flavor to the meat and it was so moist that it was falling apart when I was taking out of the crock pot. 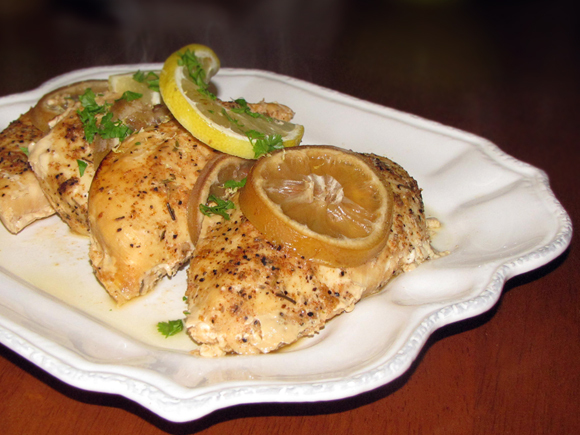 This chicken was very lemony when it was done cooking so if you're a fan of lemon, then you should definitely try this healthy and yummy dish. It was so tasty that my husband, who doesn't even like lemon flavored food, really enjoyed this meal. I served it with some glazed carrots but it would also be great with asparagus or broccoli. And if you have leftover, you could reuse it in a pasta dish or in the perfect way: Lemon Rice Soup. 1. Mix seasonings together and coast chicken. Place in crock pot. 2. Pour broth around chicken in crock pot. 3. Arrange lemon slices over chicken and cook on low for 4-5 hours. 1. Place chicken directly from freezer into crock pot. 2. Mix seasonings together and and sprinkle over chicken. 3. Pour broth around chicken in crock pot. 4. 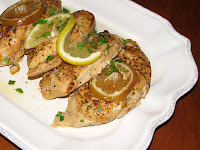 Arrange lemon slices over chicken and cook on low for 6-8 hours.